The product featured in this post is a press sample (#gifted) and links marked * are affiliate links. Please click here for my disclosure policy. Which will be pleasant news for you whether you like the Hydraluron Serum or not, because it provides both a decent alternative and an excellent companion. The Intense Moisture Lotion is packed with hyaluronic acid (the stuff that is a total workhorse when it comes to hydrating the skin and maintaining that hydration) but it has been formulated with hyaluronic at three different molecular weights, whereas the Hydraluron Moisture Serum contains hyaluronic at just the low molecular weight. I don’t want you to be forking at your own eyes with boredom at the science part here, but to explain quickly what that all basically means; the lower the molecular weight of the hyaluronic acid, the deeper the level it works at to hydrate, smooth and plump the skin. So the Hydraluron Serum works brilliantly, but just at the deep level and really needs to be followed with something else – something that works to stop water loss on the surface – which is why it’s a serum and not an all-rounder moisturiser. It’s a boost, it’s a first course, it’s the start of the hydration feast. 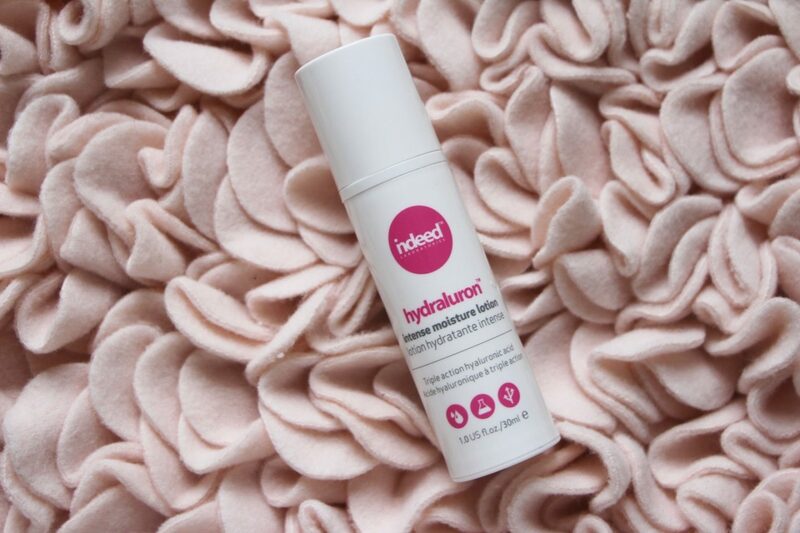 The Hydraluron Lotion, on the other hand, is an all-rounder in terms of hydration; you could easily use this alone for an intense hit of moisture and it would be covering most bases. I’ve started off this review in a very distracted fashion – I didn’t ever mean to become sidetracked with talk of hyaluronic and molecular weights – but in some ways it would be odd to talk about this lotion without mentioning the serum – as the original product in the Hydraluron line, it’s something of a cult product. It was probably one of the first products, in fact, that made me sit down and read about hyaluronic and what an earth it did. Hydraluron championed an ingredient, put a spotlight on one specific thing, and there weren’t too many brands doing that at the time. At least not in an easy to understand, relatively scientific, non-bullshitty kind of way. But back to the Intense Moisture Lotion. Light, silky, very elegant in feel, it slips across the skin beautifully but never feels greasy. It moisturises in a very straightforward and uncomplicated way and doesn’t claim to do a load of other stuff – it’s not “moisture with added retinol!” or “moisture and intensive vitamin C!”. Which makes it a brilliant choice for when you want to follow your retinol or vitamin C with a moisturiser. That just does one job. But really well. Actually that’s not quite fair; it does do other stuff. The lotion contains copper, magnesium and zinc to help protect skin from environmental damage and also squalene (olive-sourced) to soften and smooth the skin. It’s just a really nicely put-together, simple to understand, lightweight lotion. Powerful but not oily. Great beneath makeup, gorgeous after using any sort of acid exfoliant, a straightforward choice for when you’ve used something pokey and tingly and scary and you just want a bloody normal moisturiser that works and doesn’t have exfoliants and spot-busters and stuff added in for crying out loud! 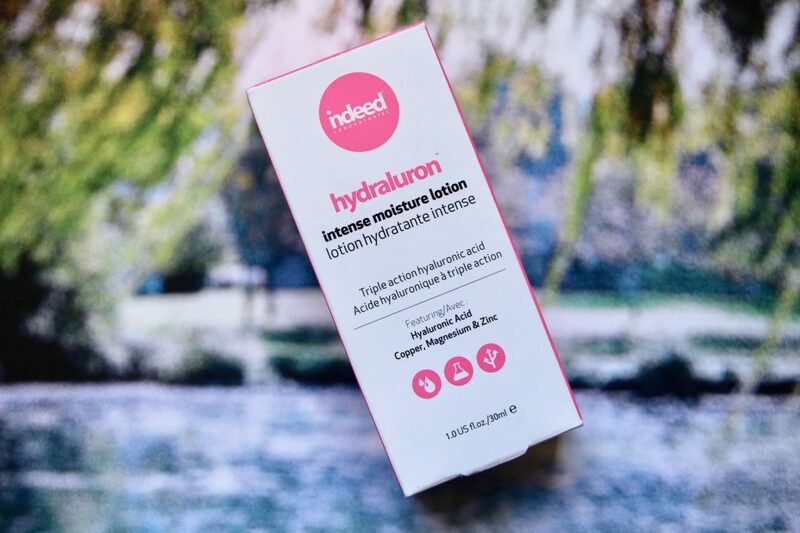 You can find Indeed Labs Hydraluron Intense Moisture Lotion for £24.99 at ASOS* and Boots. No colour or fragrance, suitable for any skin type, I’d say – though if you are incredibly dry you might not find this enough on its own. During my Retinol Fall-Out weeks I’ve been layering it under really thick, buttery creams as a sort of mega-boost! It can be used day or night, but follow with a sunscreen in the daytime if needed. Very many thanks for the review. How does this compare to the Herbivore pink cloud cream (or are they just two completely different products)? Thank you! Omg! That’s your rose petaly bath mat! I’m embarrassed to admit that I’ve been obsessed since I first saw it and wanted one (but they don’t have that brand in the States and I haven’t been able to talk myself into paying the DHL). But double duty as dreamworthy squishy bathmat and product backdrop – well done! I want the pebbly one but it’s over 200 quid. Can’t justify that at the mo!!! I have difficulty with hyaluronic acid as it seems to actually dry me out. So weird! I was using a hyaluronic acid serum and kept putting it on around my eyes which felt dry and they got dryer and dryer until they were actually flaking. Have you ever heard of this sort of situation? I want so much to love it as everyone else seems to and lightweight hydration is generally speaking my favorite sort. What gives? Any advice or thoughts greatly appreciated! The emulsifiers in the creamier formulation should allow the HA to absorb into the skin barrier a bit better. The right concentration of HA is also key. This is one instance where more is not better. You mentioned Retinol Fall-out weeks. What are you referring to? I am always on the look out for a lightweight yet hydrating cream. Hyaluronic acid is wonderful. I haven’t tried this brand before though. I like the simple formula concept. Hello, first of all, thanks for sharing such a great review and it helps a lot to know more about hydraluron intense moisture lotion. It is advised to use it daily in face and neck for better results. Sounds lovely! 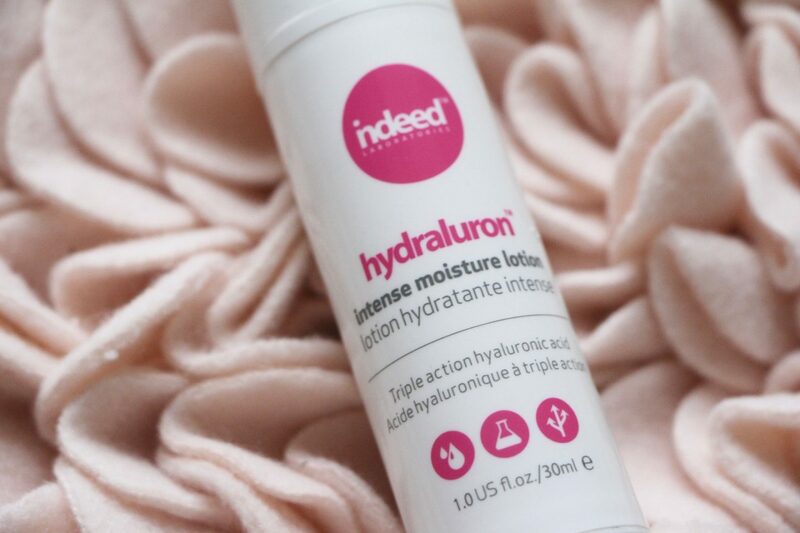 I’ve been using the Indeed Labs Hydraluron Moisture jelly under my creams at night to boost hydration this winter but the lotion might be my next purchase.